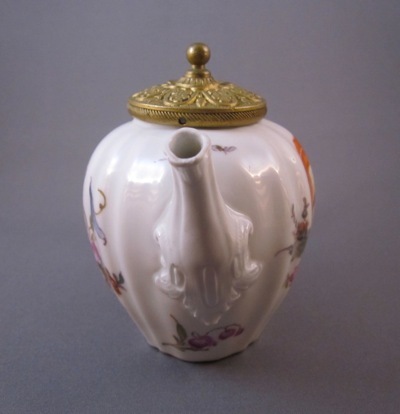 This small porcelain teapot for one was made in Germany at the esteemed Meissen factory in the mid 1700s. 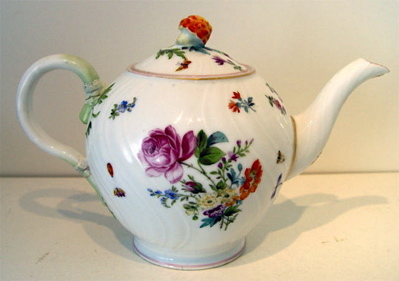 It stands 3.75 inches high and 5.5 inches from handle to spout and is nicely painted with colorful floral sprays on both sides. 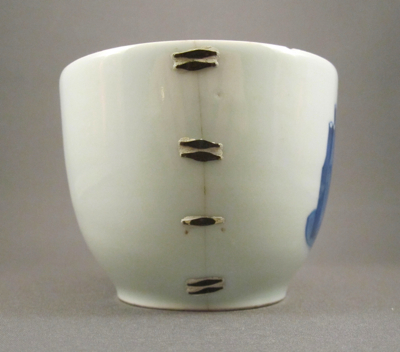 The underside reveals the classic blue crossed swords mark. 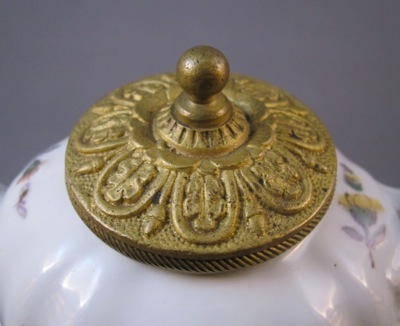 It’s impossible to tell when the original lid went missing but later in life an ornate brass lid was placed atop of the lidless pot and a marriage was made. 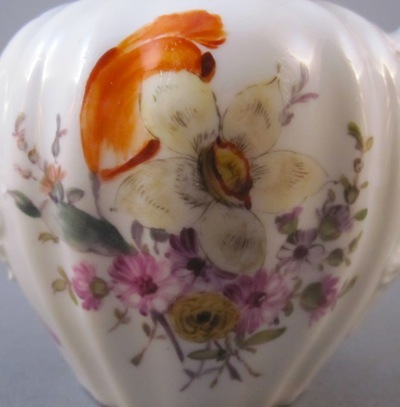 Although this lid looks nothing like the porcelain original which might have had a molded flower as a knob, it fits quite well and certainly does the trick. 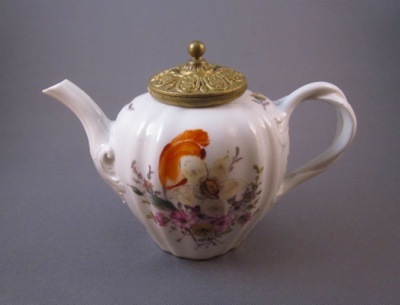 This teapot of similar form and decoration shows what the original lid on my teapot might have looked like. 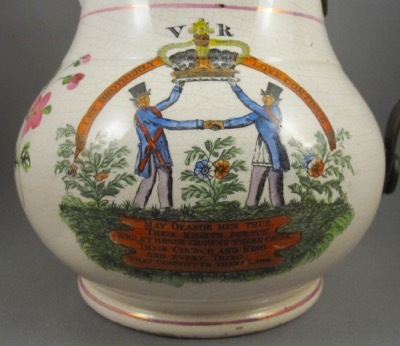 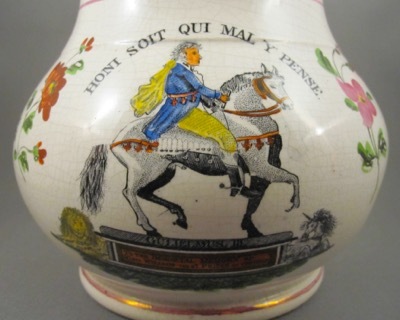 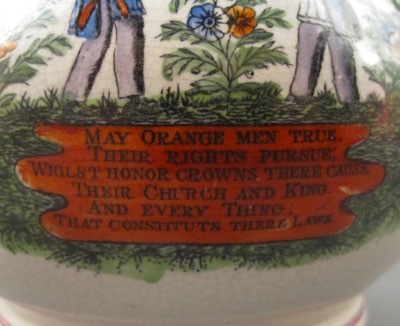 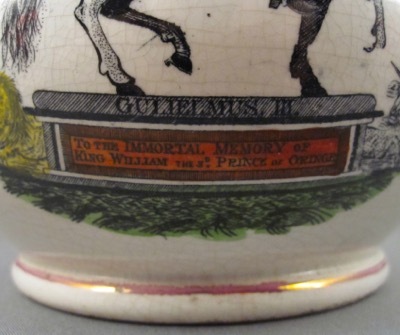 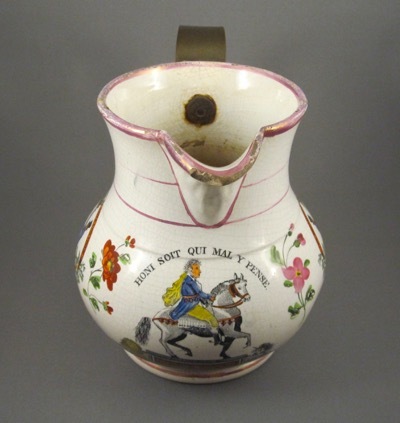 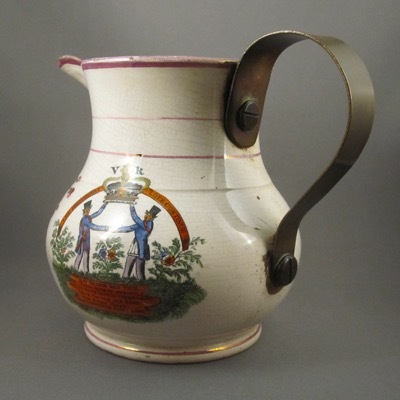 This colorful soft paste baluster form commemorative jug was made in England around 1840 and is decorated with a figure of William of Orange on horseback, figures showing brotherly love, a crown, flowers and Protestant emblems. 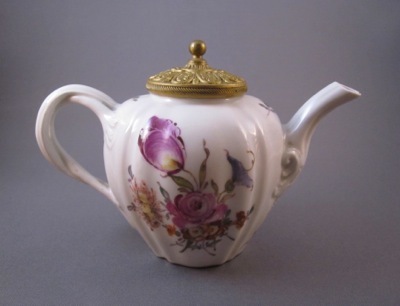 It has polychrome glazed black transfer decoration, hand painted flowers and pink lustre trim, measuring 6 inches tall and 7-3/4 inches wide from handle to spout. 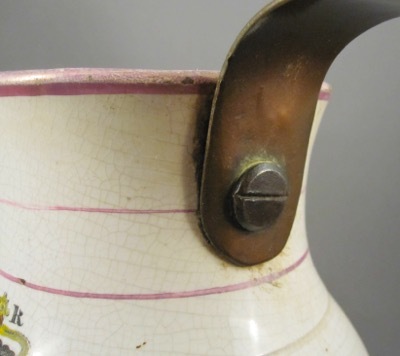 After the original handle broke off, a tinker secured the sturdy copper replacement handle to the body using two flat screws. 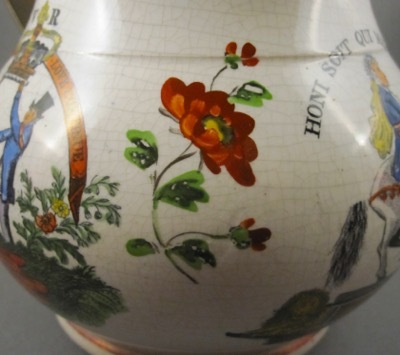 See an earlier post, Inventive repairs at the Rijksmuseum, showing a painting, Prince’s Day by Jan Havicksz Steen (1625-1679), depicting the birthday celebration of Prince William III of Orange-Nassau on November 14, 1650. 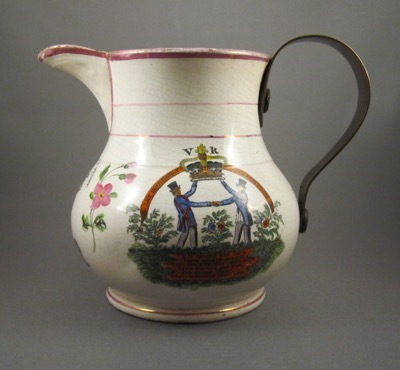 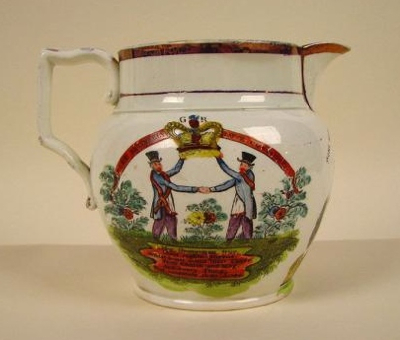 This jug with the same transfer decoration still has its original handle intact. 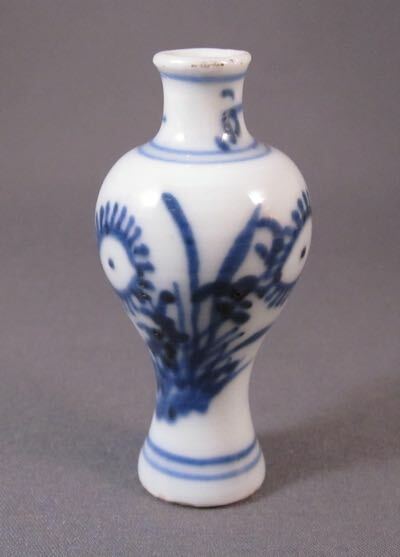 This Chinese export porcelain dollhouse miniature with blue underglaze floral decoration dates from the Kangxi period (1662-1722) and stands nearly 2 inches tall. 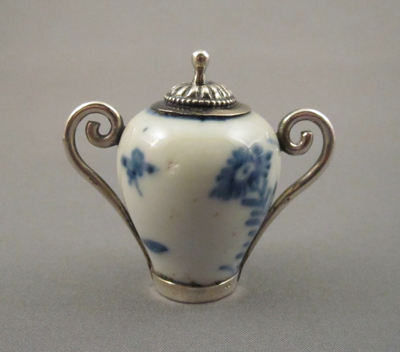 Contrary to popular belief, miniatures like this were displayed in doll houses owned by wealthy adults and were not intended to be played with by children. 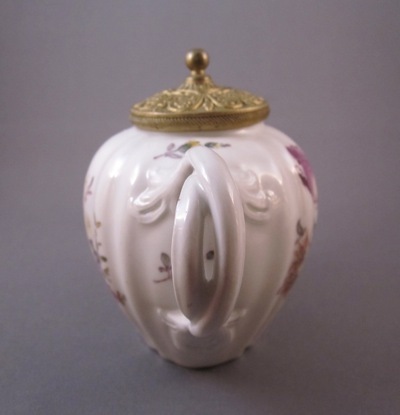 Surprisingly, this little gem was not always a sugar bowl but actually started life as a baluster form vase. 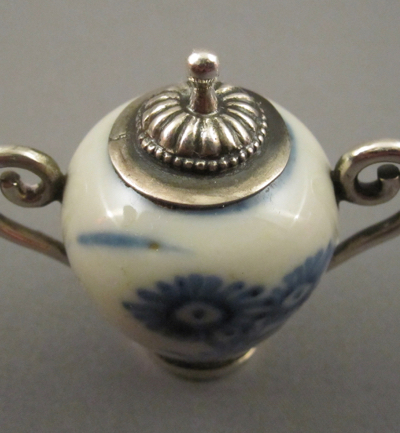 After it took a tumble, a silversmith kept the surviving middle section, added a minuscule silver lid, handles and base, and voila…a sugar bowl was born. 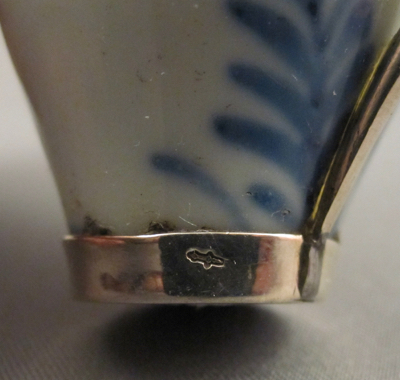 A tiny Dutch hallmark in the shape of a sword can be seen on the bottom of the base, dating it to 1814-1905. 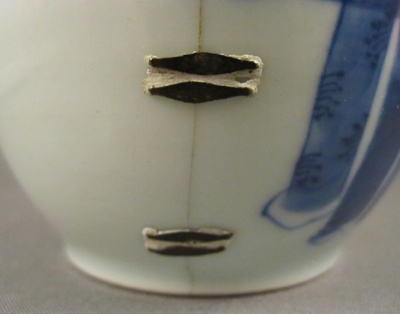 The small sword mark was used on silver pieces too small to accommodate full hallmarks. 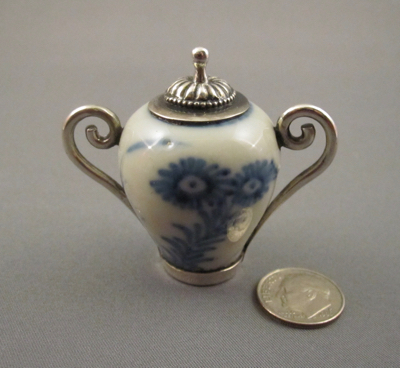 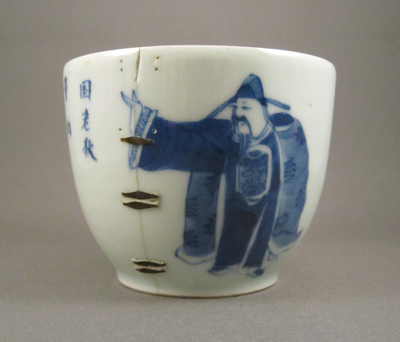 Shown below is an intact miniature vase, standing just 2-1/2″ tall. 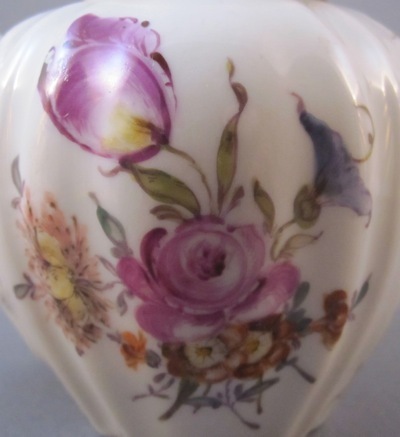 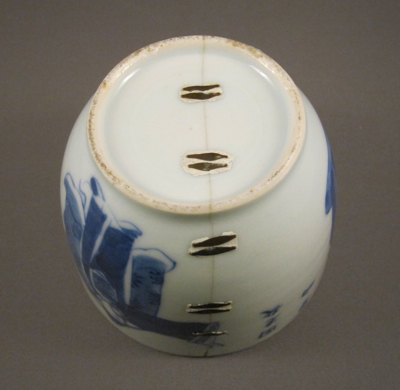 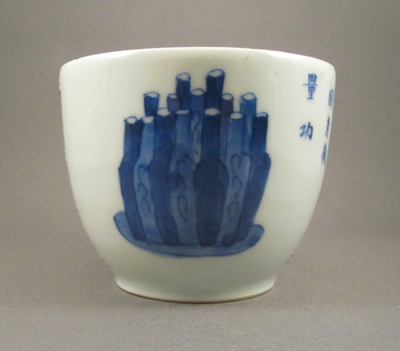 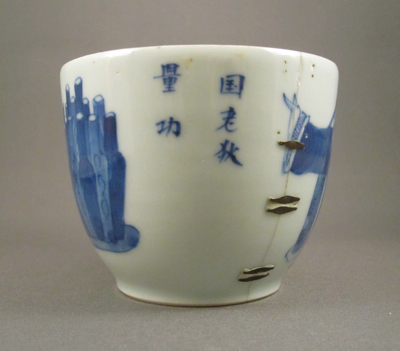 It appears that the middle section on a similar vase was used to make the sugar bowl.